We get questions from readers most days of the week asking about interesting coins they found and wondering what sort of error they’ve got their hands on. Sadly in a lot of cases these coins are not errors and are either perfectly normal coins, or some sort of post mint damage. We also tend to see the same sort of thing over and over. This article shows the more common things we come across and explains why they ARE NOT errors. 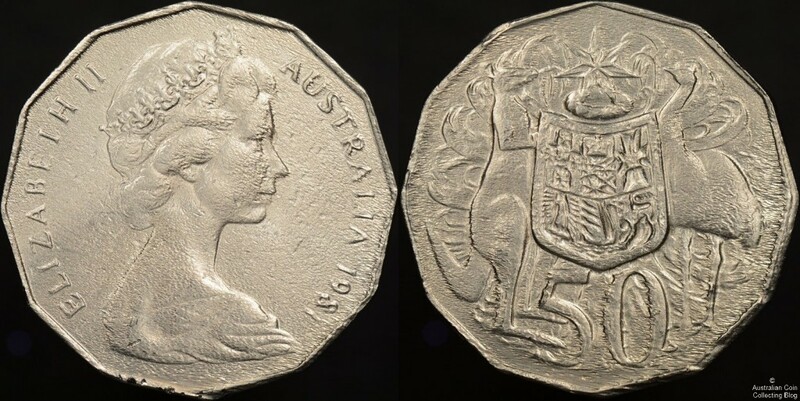 The recent glut of coloured coins released by the Royal Australian Mint have made acetone or solvent treated coins the single most common post-mint-damage coin that is NOT an error. If the colour is missing from a coloured coin, then there’s about a 99.9999% chance that someone has removed it from the coin with solvent. And this is not a new thing, it’s been going on since 2001 when unscrupulous coins sellers were removing the printed map of Australia from the reverse of 2001 dollar coins from proof sets and selling them as errors. In fact, removing colour from coins is something we’ve been writing about for almost 10 years, including this article on “uniface” 2004 dollar coins, this one about no colour $2 coins, and this one on removing the colour from printed wildlife dollar coins. People have been putting coins in acid for decades. Again, we’re not sure why but we see several pictures of acid treated coins a month. They are described variously as filled dies, strange strikes, and thin planchets. Sometimes they are treated on one side, mostly on both. But they are all just post mint damage. Above you can see a 50 cent we found in circulation that exhibits all of the characteristics of an acid treated coin. Note how the lettering appears spidery, note also they the strange indentations that are parallel and seem to be more clustered around the areas of high relief such as the portrait, the lettering, and the rims. That’s because when a coin is struck the grain microstructure of the metal is altered, with larger grains around the areas of high relief (the greatest metal deformation). These larger grains are more easily attacked by acid and hence you tend to see more erosion in those areas than in the flat and less deformed part of the coin. Some readers have tried to argue with us that it can’t be acid because it would attack all surfaces equally. Well, if those readers would like to go away and do a 4 year engineering degree that included several courses on metallurgy like one of your authors did then they are welcome to do so and come back and discuss the issue again. The sorts of damaged coins you can see above are probably one of the most troubling we see. Mostly because they are created deliberately to deceive error collectors. So called “shed jobs”, or “hammer coins”, or even “vice jobs” are created by squashing a coin between two other coins. They are then sold variously as brockages, double strikes, or multiple strikes. The coins at the top of the image above were bought at a legitimate public auction, so not only did they deceive the buyer, they also deceived the auction house. 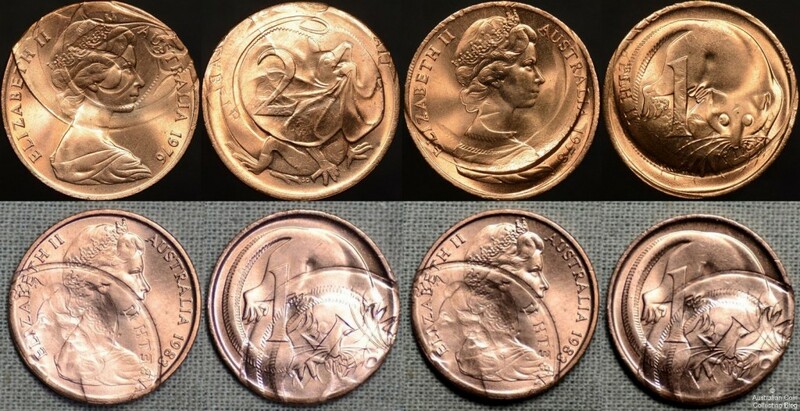 The coins at the bottom of the image were made by a friend of ours in about 5 minutes using tools from his shed. So why are they not errors? In every case the second “strike” is ALWAYS low pressure, much much much lower pressure than a real coin strike. In fact, when a coin really is double struck almost all evidence of the first strike is obliterated by the second. Other reasons these are impossible is because they require two simultaneous die caps (which is basically impossible), or even have improbable strike combinations like a 2 cent impressed on one side by 10 cent and the other by a 1 cent, a circumstance that is impossible. Our warning with this type of coin (and every other type of error) is that if you do not understand how it was made then don’t buy it. Go away and get a basic understanding of the coin manufacturing process and you’ll quickly see that these “shed jobs” are nothing more than damaged coins. Coins like that above are what we like to call roadkill coins or mower coins. Why? Because they’ve most likely spent part of their lives getting run over by vehicles on a road or in a car park. Or perhaps made close acquaintance with the spinning blades of a lawnmower. They are horrifically damaged and so horrifically damaged that we’re amazed anyone would think they are an error. And yet, somehow people do. We’ll just re-iterate what we said earlier, go away and get a basic understanding of the coin manufacturing process and you’ll quickly see that these damaged coins could never have got they way they are during the coin manufacturing process.